Here’s the brewer stand for you. 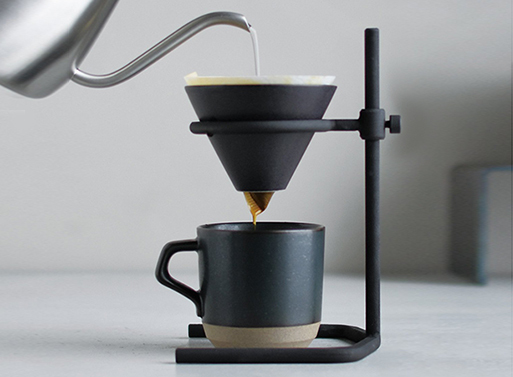 There’s a stainless steel base, a porcelain brewer, and a heat-resistant glass server. The industrial vibe is anything but fussy, thank goodness. The inner side of the stand’s ring is edged to hold the brewer steady, and the stand’s height is easily adjustable to allow for other vessels from a mug to a bigger server. If you’d like something a little more classy, do be sure to check out the Kinto Brewer Stand in walnut/brass. Available in 2 Cups or 4 Cups. 20pcs of paper filter included.